This has been a cold, snowy week, with two storms that amounted to over a foot of white stuff on the ground and temperatures well below freezing. Although I like the extra reading time that staying indoors provides, it feels like winter is dragging on to an uncomfortable extreme and I am ready for spring! An engrossing read with a cast of unforgettable characters. This story, which illustrates that it is never too late to discover unknown talents and find one's true self, has snappy dialogue, many humorous and sad moments, and enough twists and turns to keep things interesting. Flagg includes a history lesson about the WASPs (Women Airforce Service Pilots) in WWII as a bonus to this delightful novel. This is a poignant young adult novel that touches upon bullying, self identity and self esteem, friendship, and family relationships. I highly recommend it to teens and those who have a teen in their life. 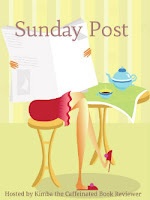 Sunday's Weekly Book Recap #51 was originally published by Catherine for bookclublibrarian.com. This post cannot be republished without attribution.